Heard about CBD vape juice, but not sure what CBD vape juice is? Then keep reading! First, let’s talk a little about what CBD is. CBD is derived from CBD Isolate found in industrial hemp or cannabis plants and contains no THC. THC is the psychoactive ingredient in cannabis which gets you high, while CBD has no psychoactive properties. Due to the fact that Koi CBD products contain no THC, they are legal and don’t require a visit to the doctor or a doctor’s script or prescription. 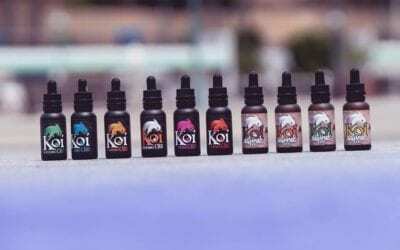 The most reliable way to purchase CBD vape juice is through certified companies such as Koi CBD. We offer discreet and reliable shipping across all 50 States and provide free shipping on orders over $35. What Are the Effects of CBD Vape Juice? The effects of CBD vape oil are similar to other CBD products, depending on the dosage of course. The most important thing, and possibly one of the best things about CBD vape juice is that it works faster than other delivery methods. Other CBD products like edibles, pills, drinks, and supplements have to travel throughout your body and digestive system, finally being broken down in your liver. CBD vape juice is taken into your lungs as a liquid and then absorbed directly into your bloodstream. THC binds with the CB1 receptors in your brain, giving a psychoactive experience. While CBD binds with the CB1 and CB2 receptors spread throughout the body, giving you a more widespread effect that doesn’t include the psychoactive experience that THC does. CBD vape juice won’t get you high and is 100% legal. What Are Some of the CBD Vape Juice Benefits? Many Koi CBD clients have already written detailed testimonials about how CBD vape juice has helped them. Some of the more common benefits associated with CBD vape juice and reported by clients is better to sleep, relief from stress, anxiety, and pain, relaxation, help with mood disorders, and some users have even reported that CBD vape juice was a great way to help with the side-effects associated with quitting smoking. CBD works by interacting with the Endocannabinoid System we have inside our bodies. We all produce cannabinoids. Naturally, CBD imitates these and binds with our CB1 and CB2 receptors. CBD acts as a key, unlocking different protein functions. When you use a vaporizer with CBD vape juice, you’re getting your dosage of CBD in controlled amounts in a faster and more economical delivery method. It’s also a whole lot more economical way to consume CBD products. If you’re new to vaping, it’s really quite simple. You load your vaporizer with CBD vape juice or pre-loaded cartridges depending on the device, and then switch it on. Now, it’s just a matter of pressing the firing button while you inhale on the vaporizer. The CBD vape juice is heated into a vapor that is inhaled and then absorbed into the lungs and bloodstream. Unlike e-cigarettes, there isn’t going to be a large cloud of vapor. Vaping CBD vape juice is discreet and convenient. Making it an ideal way to help relieve stress and anxiety wherever you may be. I read on the box of the CBD vape that it could be used under the tongue as a tincture as well. Just wanted to be sure that the Vape Juice section was the type that could be vaped or used under the tongue.